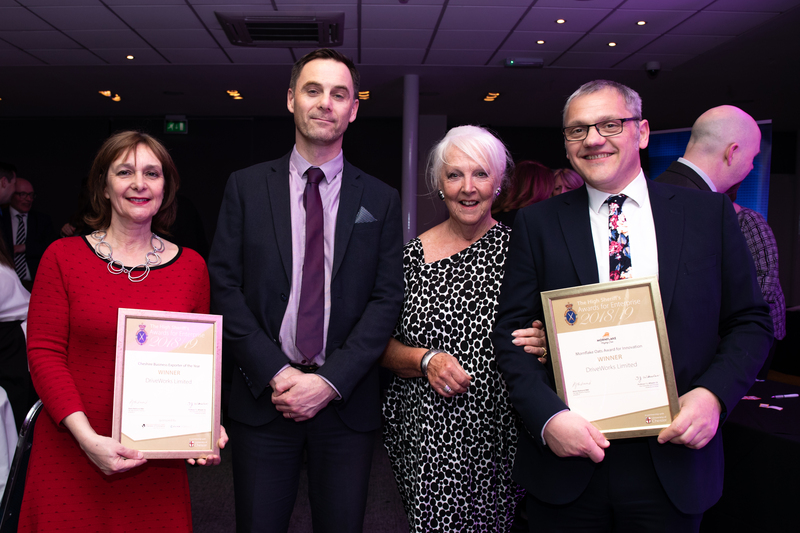 We’re thrilled to announce that we were awarded two High Sheriff’s Awards for Enterprise for 2018/19. We won the Award for Innovation and were joint winners for the Exporter of the Year Award, alongside the Tall Group. Our CEO Glen Smith and Vice President Maria Sarkar attended the awards ceremony at Chester Racecourse. They were presented the awards by Alexis Redmond MBE, the 2018/19 High Sherriff of Cheshire. 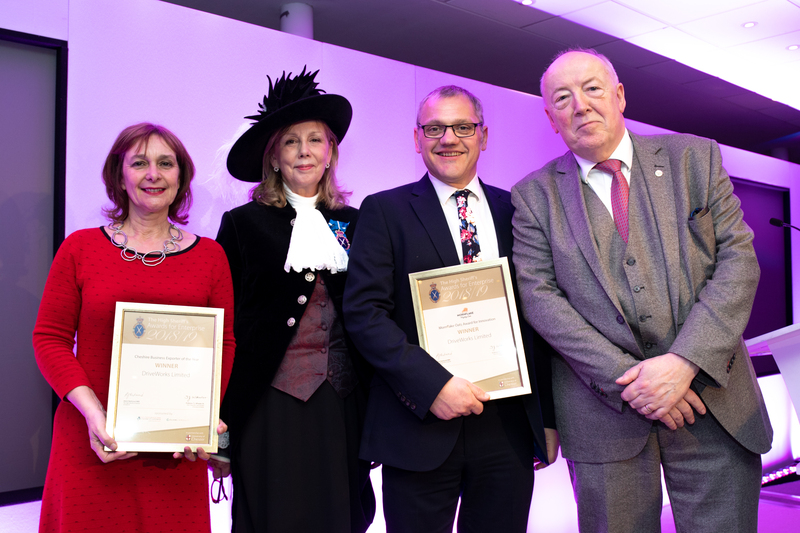 In partnership with the University of Chester, the High Sheriff Awards for Enterprise recognise outstanding achievements by enterprises in Cheshire, Halton and Warrington. The awards are the region’s most prestigious awards for business performance, celebrating the success of businesses and individuals across the county. Entrants are judged by a panel of senior members of the Cheshire business community. Maria Sarkar, VP DriveWorks, Alexis Redmond MBE, High Sherriff of Cheshire, Glen Smith, DriveWorks CEO and Professor Phil Harris, High Sherriff Awards for Enterprise Judge. DriveWorks were joint winners of the Cheshire Business Exporter of the Year Award, alongside the Tall Group. 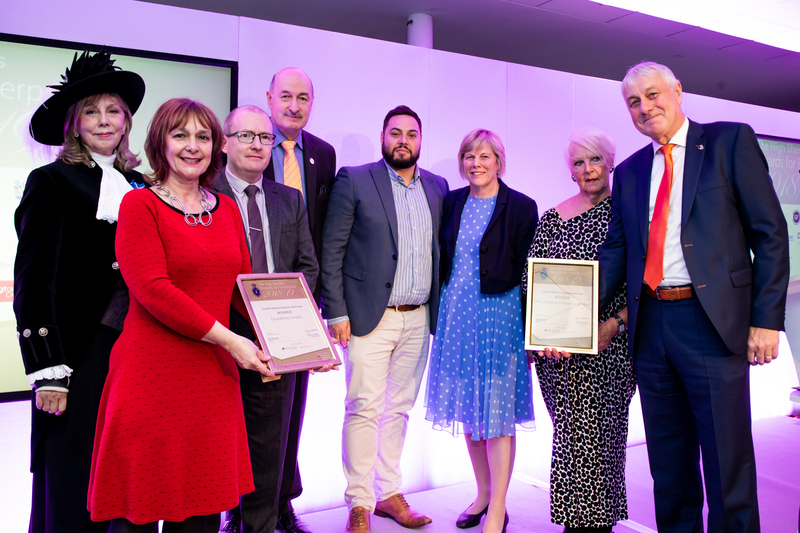 The award, sponsored by West Cheshire & North Wales Chamber of Commerce and Click Consult, recognises significant growth in international business through a clear commitment to the development of new export market opportunities. DriveWorks Ltd and the Tall Group, Joint Winners of the Cheshire Business Exporter of the Year Award, with Alexis Redmond MBE High Sherriff of Cheshire and Dr Fran Hulbert, High Sherriff Awards for Enterprise Judge. DriveWorks was founded in 2001 by Glen Smith and Maria Sarkar and has since established an international network of over 100 Value-Added Resellers across 51 countries, who sell and support our software internationally. Our software is used for Design Automation and Sales Configuration by businesses of all shapes and sizes, in a wide range of industries and market sectors and almost 80% of our revenue comes from overseas. This award recognises our achievements in building a strong channel and providing support for our software worldwide. We’re honoured to have won. We would like to thank the sponsors of the Export Award, Click Consult and West Cheshire and North Wales Chamber of Commerce, the High Sheriff and the hard-working team behind the awards that makes this such a highly respected event. We also received the Award for Innovation, sponsored by Mornflake, awarded to us for demonstrating an ability to create, nurture and develop new products. Our software has been successfully developed for more than 15 years in the industry and we are committed to continuous innovation. We are really proud to have been recognised for our commitment to innovation, it’s a huge honour. The collaborative work-spaces we have created and our company culture all foster innovation. It’s at the heart of everything we do. Being recognized inspires us to do more. Thank you to the sponsors of the award, Mornflake, for recognizing that innovation is so important. We also thank the judges and hard-working team at the University of Chester who support the High Sheriff and the Awards. 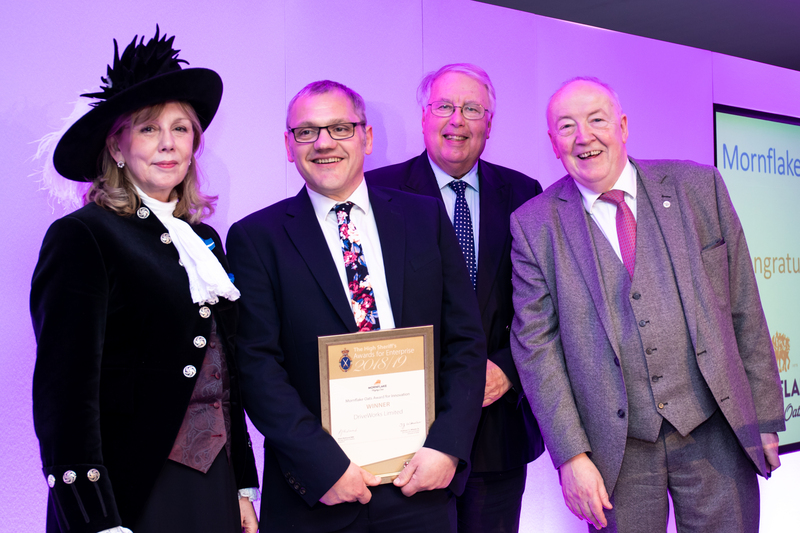 DriveWorks CEO Glen Smith Receiving the Award for Innovation from Alexis Redmond MBE and High Sherriff of Cheshire and Professor Phil Harris High Sherriff Awards for Enterprise Judge. As part of the judging process, Professor Phil Harris and Dr Fran Hulbert from the University of Chester came to visit our offices. The DriveWorks team were proud to give them a tour of our converted barn offices and show them how our spaces make for great collaboration and innovation. Both Professor Phil and Dr Fran were at the awards ceremony and we received great praise from them. Stephen Fitzsimons from Warrington & Co was also at the awards ceremony to support us. Maria Sarkar, VP DriveWorks, Stephen Fitzsimons of Warrington & Co, Dr Fran from Chester University and Glen Smith, DriveWorks CEO. We’d like to say a huge thank you to all of our customers who continuously inspire us to innovate and improve what we do. Thank you also to our value-added resellers who make it possible for us to have such a strong channel worldwide. And of course, a huge thank you to the DriveWorks team, their hard work and commitment makes all of this possible. We will continue to support innovation and hope to inspire others to achieve success too.